FILE - A Tibet supporter places his palm print on a banner during an event organized by Students for a Free Tibet to show solidarity with Tibetan political prisoners released in 2015 from Chinese jails in Dharmsala, India, Dec. 26, 2015. Members of the Tibetan parliament-in-exile are calling international attention to the case of long-imprisoned 57-year-old dissident Lodoe Gyamtso, who with a new sentence announced by Tibetan exiles stands to become the longest-serving political prisoner since the Chinese takeover of Tibet in 1951. 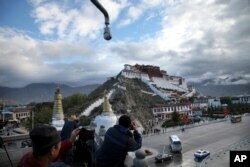 FILE - In this Sept. 19, 2015, photo, tourists take photos of the Potala Palace beneath a security camera in Lhasa, capital of the Tibet Autonomous Region of China.